I love this quote by F. Scott Fitzgerald for many reasons. Through the years of my 20’s there were many times where I felt let down or disappointed with myself by missed opportunities. Then there were times I could say that really defined my path that I took as a risk or even without being fully aware I was leaping into something great. Opportunities are what life is composed of. 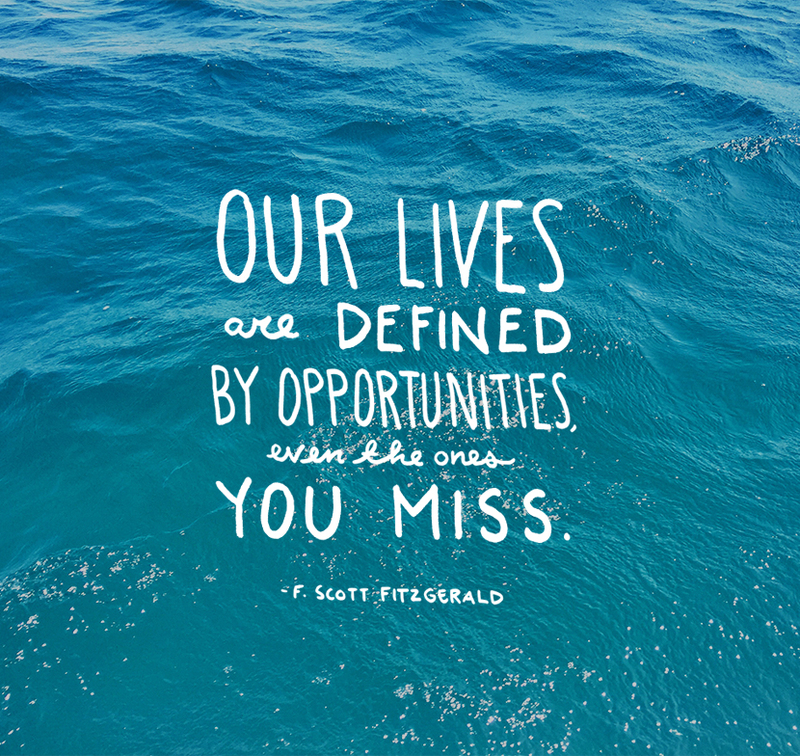 What took me time to realize, though, is that missed opportunities aren’t always something to be disappointed about. Sometimes things don’t workout for a reason and by missing something we actually gained something greater than we may have if we had had the ability to take advantage of something. It is always hard to tell and time is really the only thing that can reveal that truth. I do believe that there are have been some missed opportunities in our career as entrepreneurs but if they didn’t result in something great then they resulted in a really good lesson that grew us. I think this quote is a great one to take into Monday for many reasons, but one of them is how it connects to an opportunity I had a few years ago to speak at Circles Conference. It was a scary thing for me. Standing on a stage being livecasted to thousands and sharing my story openly to many creatives I respected. Baring it all isn’t always easy, but that opportunity grew me, it grew Mike, and it grew our business. The next year we couldn’t attend and thus was a missed opportunity, but one we had to absorb as that same week we closed on our house. Both times defined us. This year we will be there again and there is a lot of exciting things to share and opportunities for five of you to join us! This year at Circles Conference we will be teaching a workshop and joining in on a panel at the conference. We are excited to see good friends and make new ones as well. Circles is held in Grapevine, Texas just outside of Dallas at an old theater in downtown Grapevine. This year’s lineup is full of big names in design and photography. Though the tickets are sold out there are still many ways to participate such as livestream, hangout passes, and workshops. Leigh Taylor: HOW TO DESIGN FOR 50,000 WEBSITES IN ONE GO! We will announce the winner on Friday, September 4th so you have only this week to enter. Excited to meet 5 of you at Circles this year and to have you in our workshop. Those of you not able to attend we will do a recap on our workshop here on the blog. Happy Monday and good luck!!! This sounds like such a great event and your words about missed opportunities are Perfect for beginning a new week. Such a great quote! Thanks for the inspiration and words of wisdom! Sounds like quite the conference! Fingers crossed. I would love to attend the conference, but I am not going to be near the area. I just wanted to say that this quote really hit home for me this evening and I appreciate you sharing it.